Molè (pronounced Moowlay) is commonly known to be of Mexican origin. Our Molè rub is made from a variety of specially selected herbs and spices, but its the addition of Cacao and Smokey Chipotlè that give this rub its edge. The flavours are subtle, light smoke with just a hint of chocolate combine to make any dish special. This rub can be used with Pork fillet, Chicken breast or Thigh, mixed in with flour to coat chicken wings or mix with mayonnaise to create tasty dips or toppings for baked potatoes, salads, grilled/baked fish. Pembrokeshire is in the far West of Wales. It is probably more well known for being the birthplace of the Tudor Dynasty, its Historic Towns and Castles, its Pembrokeshire Coastal Path and its tremendous range of wonderful beaches, some of which have been used in feature films such as Robin Hood and Harry Potter. It a wonderful part of Wales. 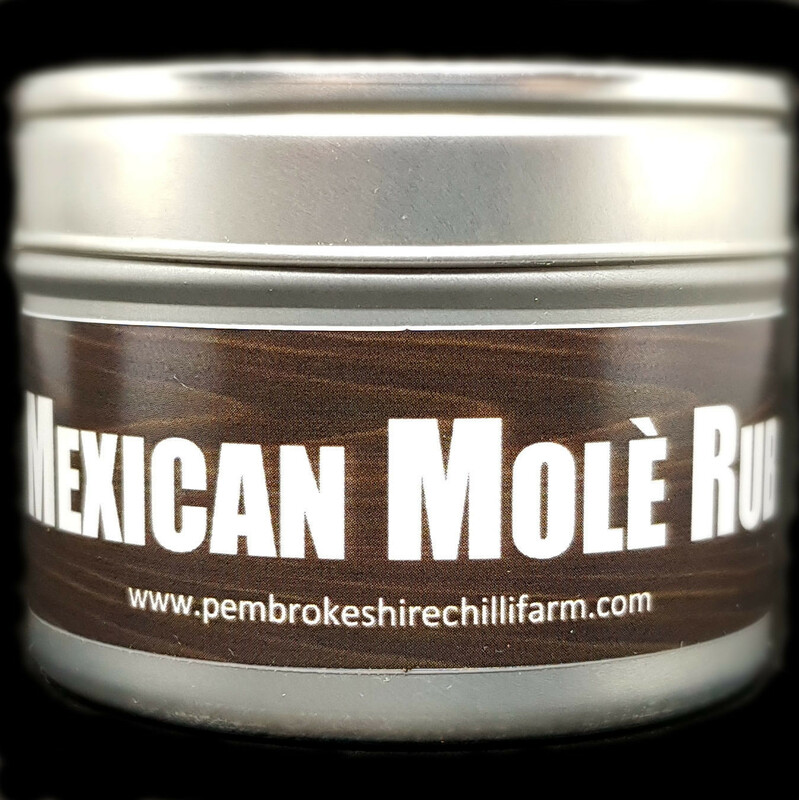 Based in the heart of the Pembrokeshire countryside, Pembrokeshire Chilli Farm has built an enviable reputation for producing a range of superb chilli sauces, jams and spices. They grow a variety of chillies and make their own unique products from them. Products that you probably won’t find anywhereelse such as their Arj Limon Chilli Jam or their aptly named Chilli BakewellJam. 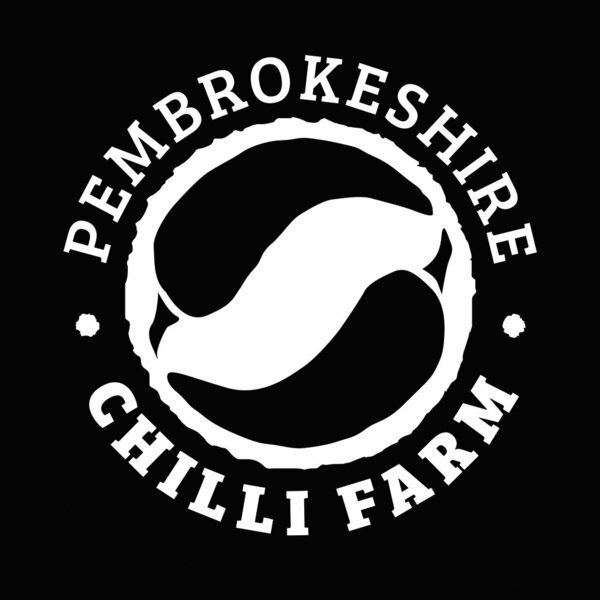 Pembrokeshire Chilli Farm was born out of a desire to reinvent the chilli using home grown varieties and simple ingredients and are the proud owner of the Pembrokeshire Produce Mark. Yum yum yum... Chipotle gold a definate winner on halloumi, and sweet chilli jam is a dream on brie. . It all started in 2016. Owen and Michelle had the dawning realisation that there was a severe lack of variety in the range of fresh chilli available in the usual supermarkets and high street shops. The range of quality hot sauces was also very disappointing. So off they went, planting a varietyof chilli seeds in the hope this would satisfy their need for the chilli. Later, in the summer and with over 150 plants, they had an abundance of shapes, colours, tastes and heat. After many experiments with flavoursthey emerged with 3 Sauces and 2 Jams. Pembrokeshire Chilli Farm was born. Since then they have added smooth fire and a greater variety in the depth of flavour to their range, they have more sauces, more jams and spice grinders, and are currently working on a Honey spiced peanut. A range of fresh chilli’s will alsobe available when the season is here (August – October). So, what does 2018 bring. Well, more fantastic flavours, more chilli experiences and above all depth and warmth to your dishes.